Your neighborhood shouldn't allow this situation to continue. Unless you are in an otherwise flawless neighborhood, it signals to outsiders that property in this neighborhood may be close to worthless. Things are so bad it doesn't even matter if we abandon the place. A video that came to our attention about land banks in Michigan is a great introduction to the subject. Abandoned buildings are rare in well-kept neighborhoods where demand for property is high, but it happens even in the nicest suburbs. When it does, the neighbors will be quite upset about the unusual blight. 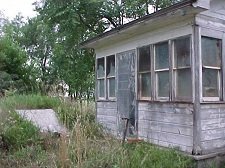 In this situation, one possibility is that the abandoned building belongs to an estate, and the heirs cannot agree on a course of action, so nothing is done. Sometimes abandonment also occurs when the owner is a senior citizen and begins to suffer with dementia or Alzheimer's. The owner may be mentally ill or in jail. No doubt you will have your own unique reason behind a problem real estate parcel. That is why community development is such interesting work. Whether you are in a great neighborhood or one past its prime, the techniques for taking action in the face of abandonment are similar; only the likelihood of success differs. We're big fans of the direct approach, you might have noticed. So that means trying to find the owner and engaging in direct talks about how to make the transition back to a well cared-for property. If you know how to find the owner, by the way, you should probably switch over to our adaptive reuse or housing rehabilitation page and start persuading the owner(s) that there's hope for the building. On this page we're assuming that you can't find or deal with the owners. The most common method of dealing with this problem is through what is called code enforcement. Most towns and nearly all cities have adopted some type of property maintenance code, or law, that lists standards that should not be violated. These also may regulate vacant lots. If the standard of the code that the town adopts are not met, it is a violation of a municipal ordinance. Commonly you will have to file a complaint to get much action from your local government, although of course if you can get your elected officials interested, so much the better. A town having a municipal code hires or contracts for a code enforcement officer. Police may handle the matter in smaller towns. A code enforcement officer does not have the same powers as a law enforcement officer, and issues code violation letters instead of tickets. Typically the government will send a notice and allow a particular number of days for the person who receives the code violation notice to correct the situation and then call for a re-inspection. Many code violations are resolved in this manner. Since a code violation case is heard in a municipal court, not a county or state court, often police are not involved, and the code enforcement officer is the city government's star witness. If, however, the violator does not correct the situation, the code enforcement officer may then send the matter to the municipal court. Commonly the court requires the violation to be corrected and allows a specified number of days for that correction to occur. If the violation is not abated, the judge may impose fines. Reporting a possible code violation should be the first course of action to address apparently abandoned buildings or lots, if your town has adopted appropriate codes. Even if there is a code and an owner who can be reached, relief is not instant. The problem with code enforcement in the abandoned buildings situation is that the local government may well be unable to communicate successfully with the owner. Either the address for the owner has become obsolete, or because of one of the mental conditions described above, the owner is unresponsive. If code enforcement cannot locate the property owner, but you have a hunch that he, she, or they live in the metropolitan area, you could try mounting a media or social media campaign. Call the newspaper or especially a television station. Television loves a really disgusting visual. Remember that your purpose is to have the situation corrected, not to drive the property owner further into denial or anger, and not to get revenge. If you find that your city or town does not have any effective commercial property maintenance code, asking them to adopt one might be a feasible option. You can use your particular abandoned buildings or lots as examples of why such a code is needed. Most maintenance codes are written by committees at an international level and adopted at the local level, so adopting the code is not a long, tedious process. If code enforcement doesn't work, your neighborhood will want to consider the legal risks of trespassing and refrain from taking action without owner permission. So you want to contact the property owner to volunteer to remove overgrown vegetation and accumulation of trash around the abandoned buildings yourselves. Many neighborhoods have done so. If a window or door is broken in, by all means contact the owner and offer to have it replaced at your own expense. Collective action is required here; you need a neighborhood organization now even if you never had one before. I've even seen the property owner show up and be angry when someone starts cleaning up the mess! If you're having little success with either, hang in there. Sometimes these situations resolve themselves on their own when an older person dies and the heirs are at last motivated and psychologically able to do the right thing and clean up the property. We should add that sometimes if the abandoned building is in a neighborhood with low property values, the heirs are disinterested or lack clear title in order to sell. See our heir property page with the photo link at the bottom of this page. If nothing else works, I've seen neighborhoods have to pool assets to buy the offending property, clean it up, and put it back on the market. That's providing they can locate the owner and that there is a market in your area. If there's no market, I hope you'll read more about community poverty, concentrated poverty, solutions to concentrated poverty, or even economic development. Find a little more information on purchasing abandoned homes on this other page.